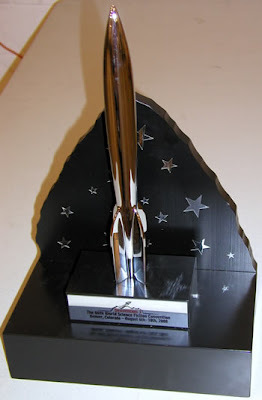 Submit entries by email to logocontest@thehugoawards.org . Submit all entries as a scalable vector graphic in EPS format, and also as a JPG. See the Submission Guidelines for detailed instructions. Include in your submission e-mail the name, age, postal address, phone number and email address of the Entrant. There is no fee to enter the Contest; however, there is a maximum of 3 Entries per Entrant. Read the Official Rules before submitting entries; in case of any confusion or discrepancies, the Official Rules govern the contest. The deadline for Entries is midnight (one minute after 23:59) on May 31st, 2009, Pacific Standard Time. All entries should be acknowledged within one week of receipt; however, the organizers cannot be responsible for entries or responses lost in e-mail. If you have questions about the rules or other aspects of the contest, leave them as comments below or write to logocontest@thehugoawards.org. Although all questions should be answered, no reply is guaranteed. Photo courtesy of Hugo Awards. μου έχεις λείψει πολύ! Πότε θα κατηφορίσεις???? ?